A comparison of four free raw file processors: RawTherapee, Darktable, Lightzone and Photivo. This article was first published in January 2014 and represents my views at that time. With the exception of Darktable, which is not yet available for Windows, all of the applications are available for Windows, Mac and Linux. All are free and open source downloads. I am looking for a raw file processor that will allow me to develop raw images to produce files ready for projection (at 1400 x 1050 pixels) and files at full resolution for further development, as necessary, to make high quality prints. I don’t expect to print directly from the raw processing application though this might be an advantage. I have used both RawTherapee and Darktable for over a year and have recently tried Lightzone and Photivo so I will restrict my comments to these four. Colour management – ability to handle input and output colour profiles and to select a working colour space. The basic adjustments – exposure, white balance, levels and curves, saturation etc. Perspective correction – e.g. correction of converging verticals. Lens correction – geometry (pincushion and barrel distortion) and Chromatic Aberration. Vignette – either to correct the effect of lens vignetting or to introduce a vignette for artistic reasons. Denoise – to reduce noise effects in low light shots and/or use of high ISO settings. Sharpen – by use of unsharp mask, possibly other options. Monochrome conversion – not simply by desaturation. Output file format – as well as jpeg for projection or web use, a lossless format such as tiff. 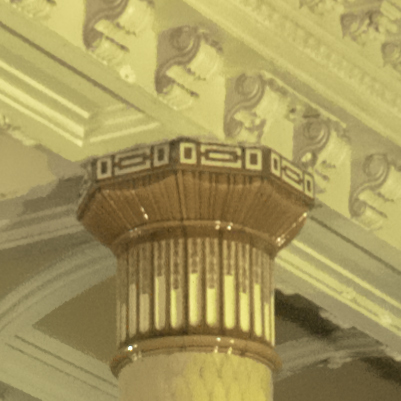 Gradient filter – e.g. to darken a sky. Local adjustments – e.g. burn and dodge. Cloning – e.g. to remove blemishes. So, how do the candidates shape up? As well as considering which features are available in each, we should also consider ease of use and general impressions of the GUI, and perhaps most important, the quality of the finished image. To compare the raw processors I chose a rather “difficult” raw file. 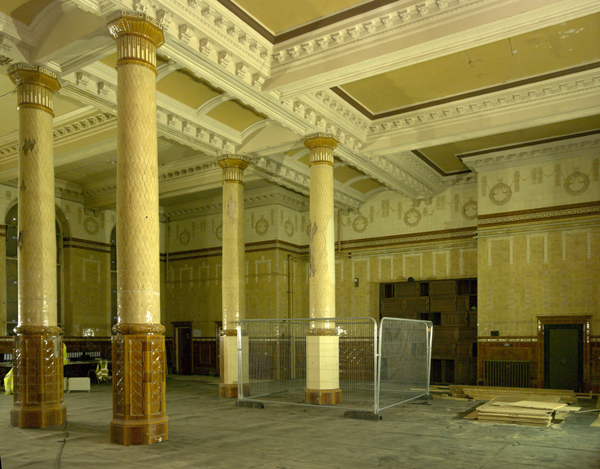 This was one of a series shot on a visit to the old town hall in Oldham which is currently undergoing refurbishment. 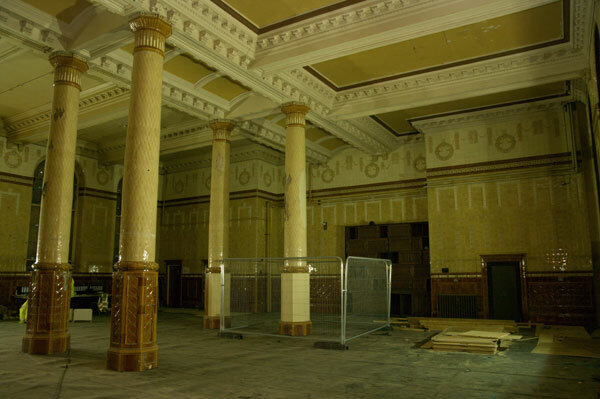 The shot is of the “Egyptian Room” lit mainly by the contractors lamps which were at floor level just out of shot to the right. Additionally a flashgun on the camera fired which did nothing to improve the shot, only causing burnt out highlights as it reflected from the glazed tiles around the room. I had set the ISO to 500 on my Pentax K20D but the shot was underexposed providing a challenge for the denoise functions of the raw converters. As the table shows, two of the raw processors offered a wide choice of demosaicing methods, but as amaze seems to do what it says on the tin (i.e. amaze) I am not sure why we need the others. After several years with Adobe products, this was the first free raw processor that I tried, having been a Linux enthusiast since Ubuntu 8.04 (April, 2008). It has always been my hope that I could one day abandon MS Windows altogether but I still occasionally need Photoshop and Gimp’s progress has been disappointing. RawTherapee provides all of the “essential” functions listed. At first I thought there were no guidelines available to assist in correction of perspective but when Crop is enabled a selection of guides, including a grid is available. The subtle nesting of sub-modules within modules makes this less than obvious. 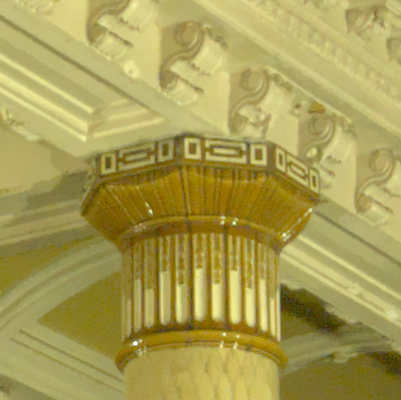 Unfortunately, in correcting converging verticals there is an unwanted cropping off the top of the image. The use of lens correction profiles (imported from Adobe’s dng converter, which is a free download) did not work correctly (the effect appeared to be inverted – applying the profile made the pincushion effect worse rather than better) and I had to use the manual slider instead to correct the pincushion distortion at the 17mm end of my Sigma 17-70mm lens. Conversion to monochrome does not have a dedicated module but very satisfactory results can be achieved by using the desaturate control with the channel mixer. None of the “desirable” functions are available in RawTherapee. Darktable offers a large number of modules, which could be off-putting to some people. The best approach is to use only those which you require and understand. 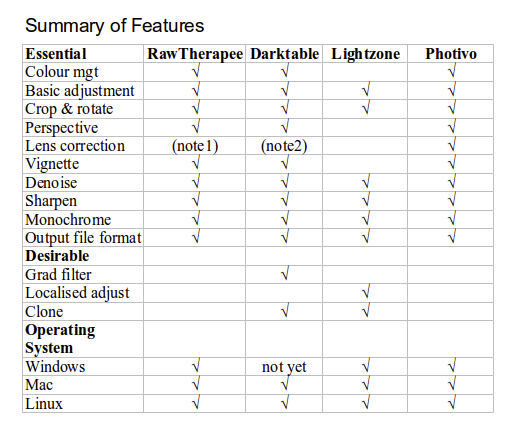 Darktable provides all of the “essential” functions listed. Input and output colour profiles can be selected; the working colour space is Lab using 4 x 32bit floating point buffers, so there should be no concerns about banding due to limited bit depth. Perspective correction is easier than in RawTherapee and does not result in unwanted cropping of the image. Lens correction can be selected from a list of profiles. My Sigma 17-70mm was not listed but selecting a Sigma 17-35mm gave an excellent result, (The shot was taken at f=17mm), however I could not find a manual method for adjusting pincushion/barrel distortion, so it appears that you must just select a lens profile that works. A module is provided to convert to monochrome. This allows the selection of a virtual colour filter which is applied before desaturation of the image – easy to use and gives a good result. Of the “desirable” functions, a graduated density filter is included which works well. There appears to be no way to burn and dodge but there is a “spot removal” tool which works by cloning, not as easy or as versatile as in Photoshop, but it works. I was almost put off LightZone when I read that it “…differs in many fundamental ways from pixel painting programs that force you to think in terms of pixels or use complex mathematical concepts like histograms and curves.” (quote from the online help, my italics). I would have thought that any photographer working digitally would want to understand histograms and curves. However, when you look at “ZoneMapper” it turns out to be a curve adjuster in disguise – when you move the zone boundaries up or down you are applying a curve which differs from the neutral straight line. I suppose some might find this easier to understand and perhaps the designers of LightZone have recognised this. Lightzone provides only six of my ten listed requirements: I found no mention of colour management or input or output profiles. There are no tools for perspective, lens corrections, chromatic aberration, or vignetting. On the plus side it does have a clone tool and the ability to print. Local adjustments are possible by selecting a region when applying an adjustment. Despite the comment about curves and histograms, there is the option to display a histogram. Personally, I also want to see curves, so Lightzone will not be my favourite. Photivo’s GUI is very different to the other three. Some things are difficult to find and it is necessary to consult the manual for explanations of what some controls do. The sequence of tabs appear down the left side of the screen in the order in which the processes are applied. Unlike the others, Photivo allows you to set the scale of the image for you to work on. If set to 1:4 the speed (as seen when making an adjustment) is comparable to the other applications but if set to 1:1 it is painfully slow. Working with a quarter scaled image is OK until you want to see the effects of denoising or sharpening. The documentation suggests cropping a small area, work on that at full scale, then apply the adjustment to the whole image. This begs the question “How do the others do it?” Perhaps they too work on a scaled down image most of the time but go to full scale automatically when assessing denoise or sharpen? I don’t know. If you work on your image at 1:4 you must remember to select “save full size” when finished if you want to retain the full resolution of the raw file. Photivo has all the functions on my “required” list but none of my “desirable” functions. One small point; I have no objection to “cross processing” being included in the tab labelled “Eye Candy” but surely conversion to monochrome deserves better. It was necessary to add the Adobe RGB (1998) profile to the output profiles folder as it is not provided by default. Note 1. Lens profile imported from Adobe (RT manual p72) does not work correctly, manual sliders ok. Note 2. Some lens profiles available in drop-down. Apparently no manual method for geometry. If you are not comfortable with histograms and curves, have a look at Lightzone, perhaps also read Ansel Adams’ book on the zone system or look at http://en.wikipedia.org/wiki/Zone_System. LightZone appears to be aimed at a less demanding (and perhaps therefore, wider) market but it falls well short of satisfying my requirements. Photivo looks promising, but it’s not there yet. The problem of processing speed will no doubt be addressed and, for me, the unusual user interface is not a problem. Well worth another look. I currently see RawTherapee and Darktable as very close competitors. Whilst one might have the advantage in one area it is often balanced by the other being preferred for other reasons. Rawtherapee has a slider to adjust for the pincushion or barrel distortion of a lens, which is useful if your camera or lens is not included in the lensfun database. Darktable has a spot removal tool which provides a simple cloning function. So, I shall be using both of these applications and keeping an eye on Photivo. As these three are developed further, perhaps a clear leader will emerge.